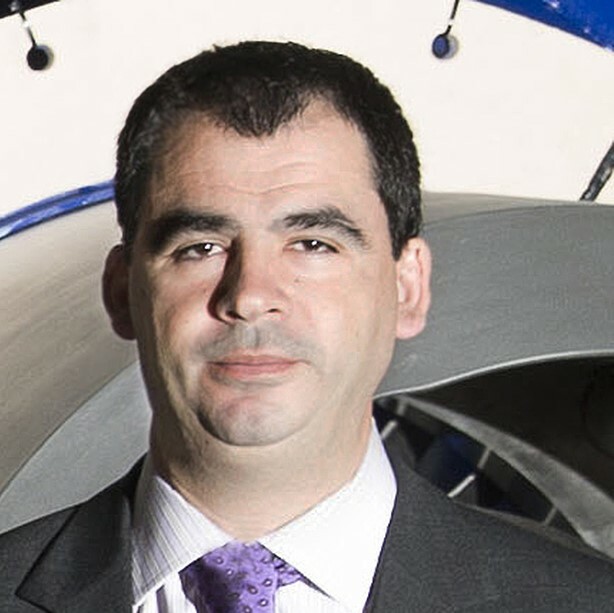 With the recent signing of the Paris Agreement in which countries take on new commitments in advancing in the use of renewable energy with marking new milestones in reducing emissions, it becomes increasingly necessary to develop new equipments by using alternative fuels to traditional ones. In this respect, E & M Combustion offers a new line of burners which fuel is the biomass, including pellet burners. There are different biomass: pellet, chip, grape pomace, olive bones … .. Among all the biomass, the pellet is the easiest one to be used as fuel in the biomass burners and it is the most homogeneous and presents one of the highest L.H.V. Due to this more homogeneity of the fuel, best results are obtained with combustion burners that use pellets as fuel. One of the inconvenients of using biomass as fuel is ashing. 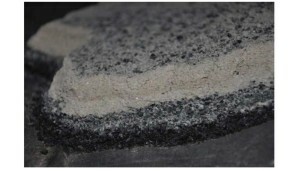 Using pellets, ash content may change in a range between 0.5 and 1.5%, depending on the origin of the material used for the production of pellets. Although there are automatic ashes cleaning systems, it is always necessary to clean periodically the burner and boiler manually. 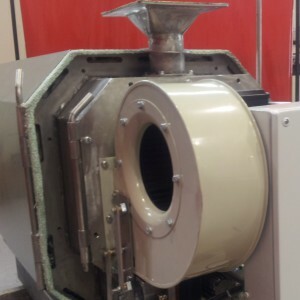 This frequency can range from daily and weekly, depending on the type of furnace, hours of operation, power levels…..
E & M Combustion has developed hight technological pellet burners that can be installed in the place where before there was a fossil fuel burner, and in most of the cases do not need to modify the boiler door. 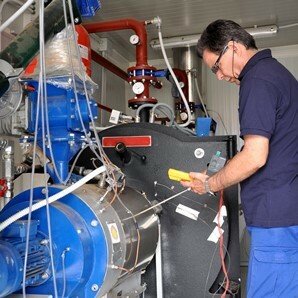 Since the beginning of the project E & M Combustion thought that the new developed pellet burners could easily replace the conventional ones, without reducing the power output of the boiler. Most pellet burners on the market gets the pellets combustion chamber within the boiler furnace, resulting in a reduction of the useful boiler power in around 20-30% since part of the heat released by radiation in the chamber is lost. In addition, existing burners operate with a very important excess air, O2 10-12%, a reason which further reduces the efficiency of the boiler. In the development of E & M, we chose to locate the pellet combustion chamber outside the boiler furnace to avoid having a reduction in the power. We also carefully designed the combustion chamber for operating with O2 levels similar to those of a conventional fuel burner to avoid penalizing excessively the performance of facilities. To reduce emissions, combustion is performed in stages, providing the air in the chamber in three different areas. Primary air: it is introduced below the grid and is the first to react with the pellets. Secondary air: it is fed directly into the combustion chamber by the entrance area of pellets to said chamber. Tertiary air: It leads through a double existing wall in the combustion chamber and is introduced into the middle-end of the combustion chamber. 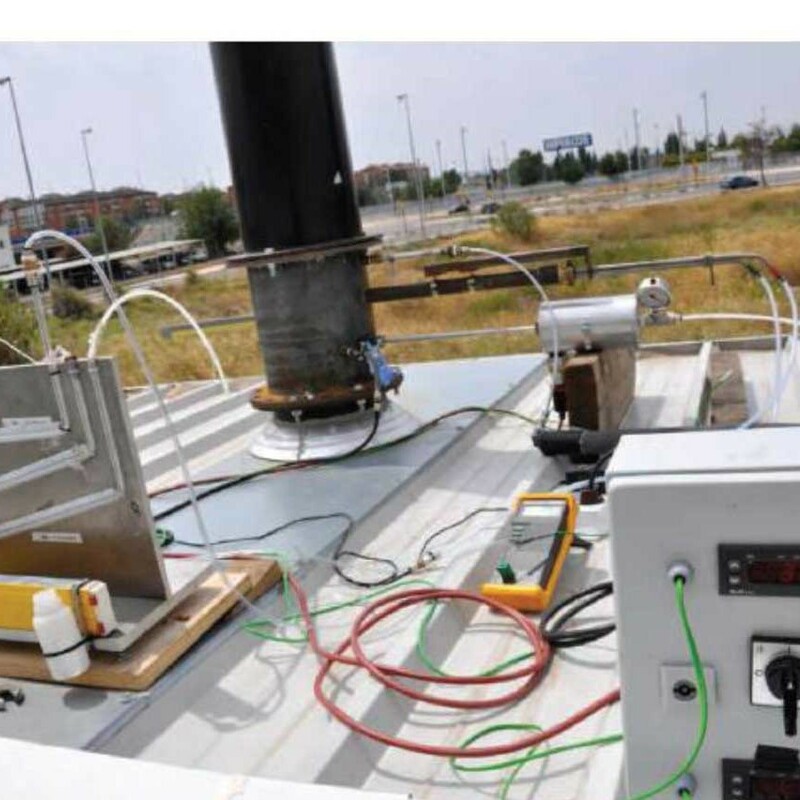 We present a series of results obtained by the Laboratory of Industrial Combustion belonging to LIFTEC (Research Laboratory of Fluid Dynamics and Combustion Technology), a joint center CSIC-University of Zaragoza, after testing a E&M pellet burner of 750 kW in a conventional hot water boiler of 600 kW. 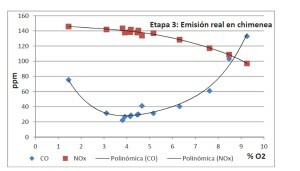 As shown in the chart below corresponding to the emission measurement in a pellet burner of 750 kW, the best CO emissions are obtained with some excesses of air comparable to those of liquid fuel, air, f.e. heating oil. In the chart above you can see how the burner can work with very low O2 values, similar to those fitted to work with liquid or gaseous fuels. The O2 should never drop the value of 1.5%. For safety reasons, the work area should be around 2% and 4% of O2. 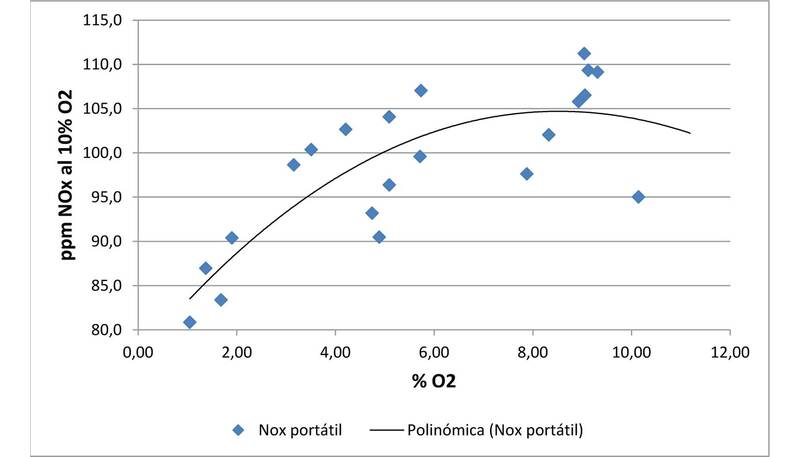 Regarding NOx emissions, the chart below shows the emissions based on the excess of air. The vertical axis range is narrow (80-115ppm). 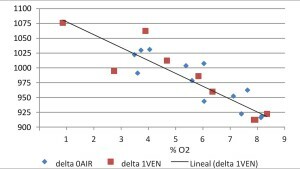 The adjustment line grows with the excess of air while reducing its slope, reaching the maximum value around 9% oxygen. From this point, the trend is reversed, reducing emissions. 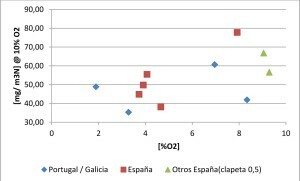 The tests were repeated for different loads and types of pellets with origin in Spain and Portugal. 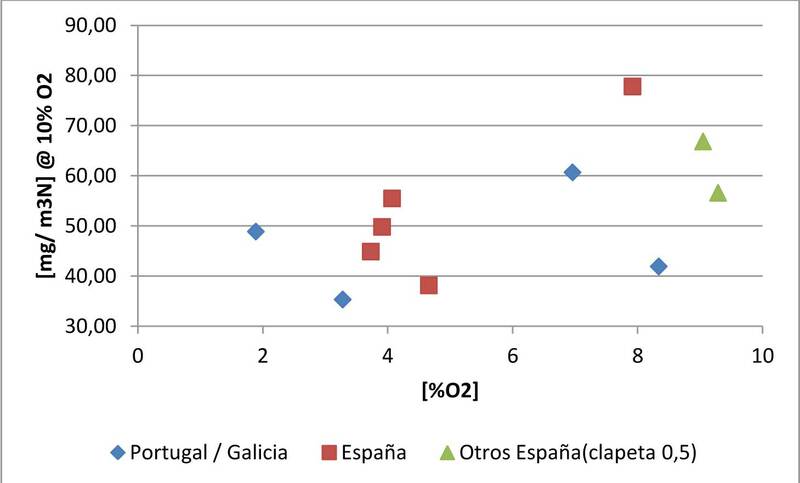 In general it can be said that the same trend and values for emissions keeps, while NOx emissions are slightly higher with pellets of Galician and Portuguese origin. There have been several measuring particle emissions tests, with reference to the UNE-EN 13284-1: Stationary source emissions. Determination of particles in low concentration. Part 1: Manual gravimetric method. 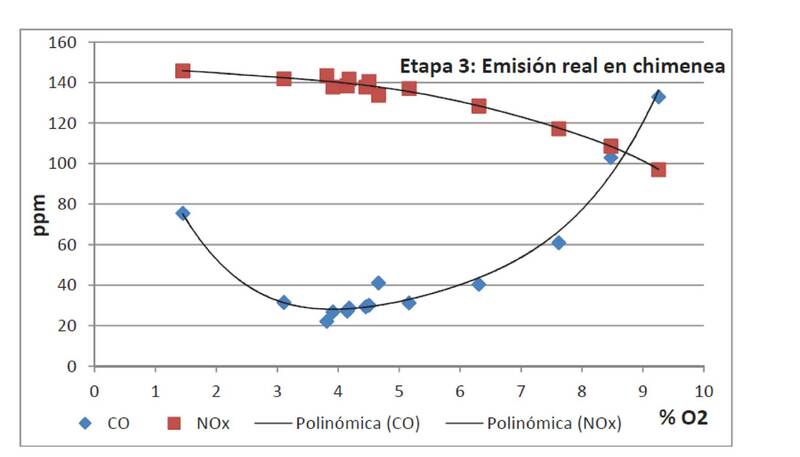 Among the operating variables which influence in the emission data collection, we find the time fouling of the boiler and the air-fuel controls in the burner. A higher level of contamination is a greater accumulation of draggable ashes. This fact is favored by higher flow rates and speed fumes through the boiler and chimney smoke evacuation. 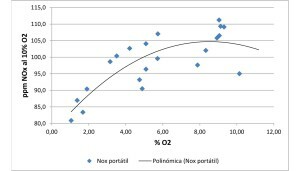 From the total of 11 tests made, it is difficult to draw general conclusions about the influence of each of these and other possible variables in the rate of emitted particles. The figure below shows the results obtained in the combustion of pellets from different backgrounds. 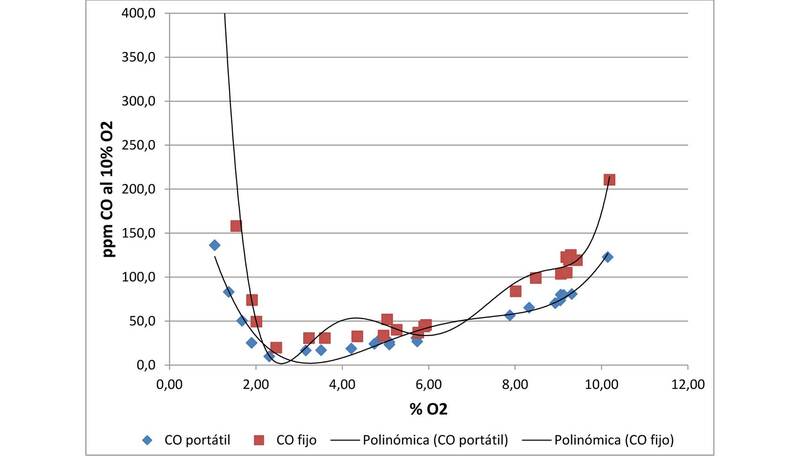 The results are shown based on the oxygen in the smoke. In general, the emission is between 40 and 60 mg / Nm3 at 10% oxygen. For reference, standard EN 303-5: 2012 Heating boilers. Part 5: Special boilers for solid, manual and automatic load and rated output up to 500 kW fuel marks as limit values 40, 60 and 150 mg / Nm3 at 10% oxygen to differentiate between types of boilers. A matter of great importance in pellet burners are the processes related to the formation of solid waste. The presence of unburned particles reduces fuel efficiency and thermal performance. The particulate emission has as a big inconvenience in the pollution action (in fact, the legal limits must be met) and the fouling which generally adversely affects all the features of the facility and increases the needs for maintenance and cleaning. E & M, in development of burners for pellets, paid special attention in this respect, and for this reason it is installed on the burners over 300 kW a device that periodically clean the ash grid where combustion of the pellets occurs. In this way it is possible to eliminate the ash build up inside the boiler as well as in the combustion grid. These ashes are carried to a closed tank where they accumulate until emptying. However, during normal operation of the burner, a small drag of pellets is observed into the boiler. They are half-burned pellets that lighten its weight due to the gasification of volatiles and partial combustion which are easier to transport. In some cases they hit the back wall of the boiler and then sticks in the bottom of the chamber. In the cleaning of installation it shows that the grid contains a small amount of various waste. This is related to its state at the time of the switch off of the operation but this does not represent a stationary accumulation. The greatest amount of unburned carbon and ash is located in the chamber of the boiler which represents the main ammount of solid wastes. In the fumes tubes, we cannot appreciate a large amount of wastes while it can be seen a second accumulation in the output gas collector although with less volume than that detected in the chamber. Significant differences between the type of material found in each of these areas is observed. On the contrary, the wastes deposited in the boiler furnace are a mixture of ash (in gray) and unburned (blacks). They are deposited in the form of longitudinal side. We can appreciate in the figure the curious layered structure that acquires. The presence of unburned pellets is predominated in the background, in the closest part to the boiler. When deposited half-burned pellets, the boiler tends to cool and extinguish them before they are completely consumed. As the layer of wastes grows in turn it acts also as thermal insulation and hinders heat transfer from the new pellets that are deposited. This favors the complete combustion and incorporates successive layers with greyish tones up to a thickness from which all residues are virtually ash. The outer layer is representative of the state at the time of switch off and therefore the unburned particles are appreciated. This transitional process of accumulation of waste is going to have influence on combustion, especially as the first layers with a greater presence of unburned pellets. This process occurs during the operation in a variation of the excess of oxygen in the smoke, reaching the highest values after starting with the installation clean. As the presence of unburned is reduced (which for the purposes of stoichiometric balance is similar to ash) more oxygen is consumed and its content is reduced in the fumes. As a final point, and no less important, at least for the burner design, a comprehensive study of the evolution of the temperature inside the burner and boiler is performed. 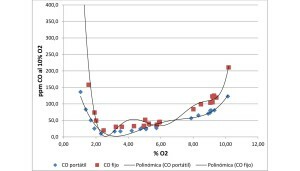 This study has determined how the heating periods in the boiler are and references have been obtained on the thermal requirements that must withstand burner materials in various operating conditions. Combustion chamber where the pellets and flame tube occurs is the burner area that bears a higher temperature and wear erosion. Temperatures in the combustion chamber are not homogeneous and are quite different from the lower zone (combustion grid) to the dome of the camera or to the sides or rear and front walls. Temperatures can range generally between 800 ° C and 1200 ° C, depending on the area, power and excess air provided to combustion. That’s why these areas should be made in materials that are able to correctly react to rapid temperature variations that occur and oxidation flame produced by combustion. In fact in certain size burners peaks they were observed in the combustion of almost 1,300 ° C, which necessitates the use of special materials, as mentioned, to endure this temperature. After studies and tests for the study of pellet burners in small boiler (boilers from 300 kW to 1500 kW) size the following conclusion were obtained. You can get a performance similar to traditional fuels emissions in this type of boiler, but this requires that the flame is similar to gas or diesel burners so that the ratio of heat transfer by radiation and convention is similar to that obtained by traditional fuels. For this event it is necessary to use all the heat transfer surface of the boiler, and therefore that the combustion chamber of biomass is not taking part in the boiler furnace. It is also necessary that excess combustion air stays around the 20% (O2 values around 3%). 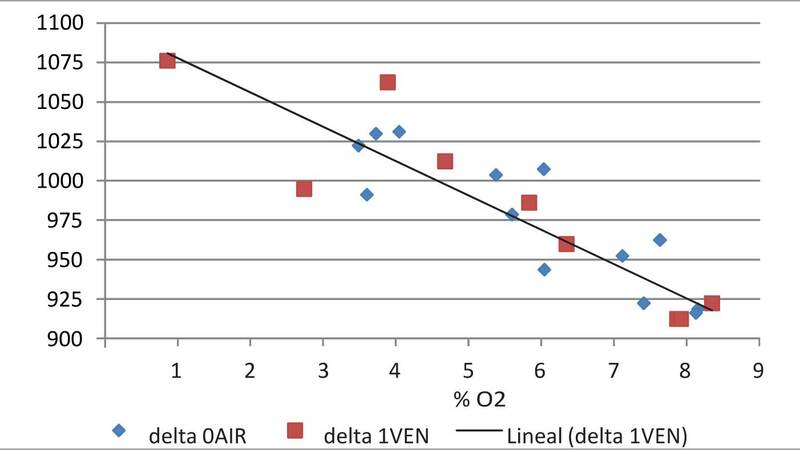 With excess air of 70-80% (O2 values around 10%), the boiler efficiency decreases by 8-10%. Efficiency will always be conditioned by the cleaning of equipment. Although you can install automatic cleaning systems that lengthen the periods of cleaning, it will always be necessary before or after a manual cleaning of the boiler or generator. From heat output of 300-400 kW the use of special materials to withstand the high temperatures generated in the combustion of biomass is necessary. Traditional refractory steels do not guarantee an appropriate half-life of the equipment.